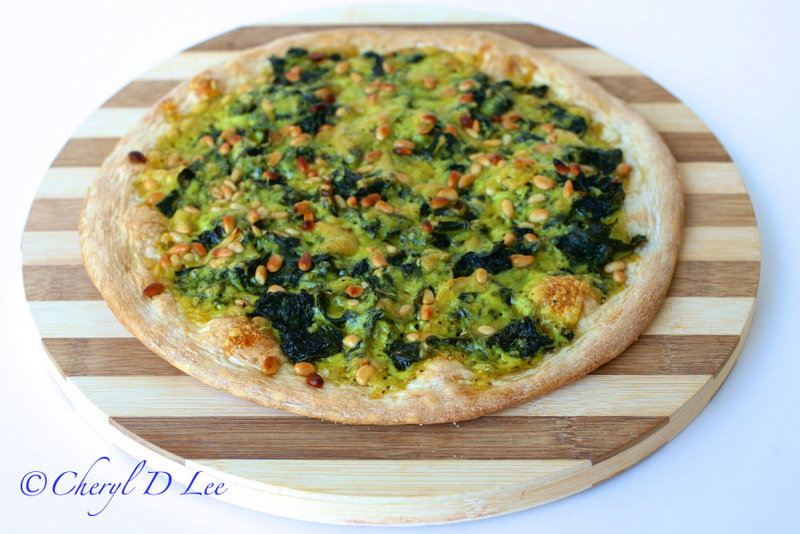 Power Greens Pizza with Pine Nuts. Say that three times fast! 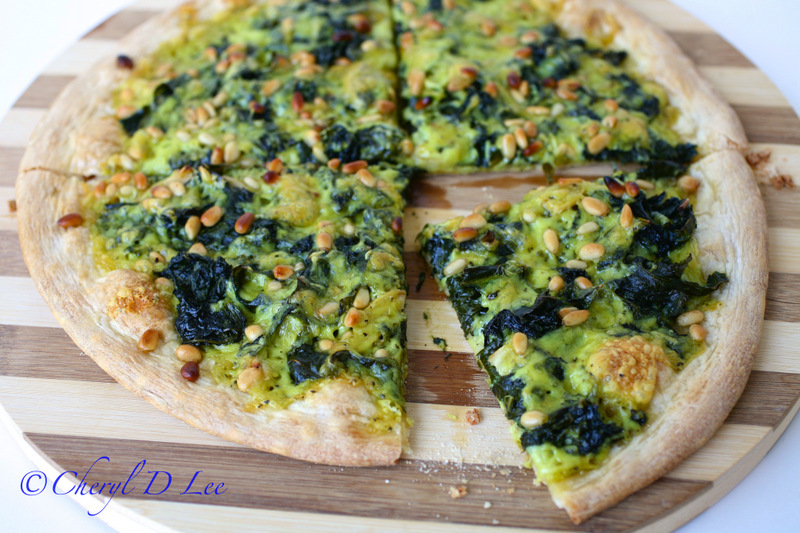 I love this recipe because it is an easy weeknight meal, made with some leftover greens and pantry staples. I don’t really know how to make small portions, due to being raised by women from the south. You always had to make sure you had enough food in case someone dropped by. Therefore, leftovers are a constant in my refrigerator. Rooting through my fridge for something to cook for dinner one night, it looked pretty bleak. I am not one of those people who plan out a weeks worth of meals, and are really organized, and never serve the same meal twice. Whatever. I found some leftover kale and collard greens, and the lightbulb went on. Maybe it was the refrigerator light, I’m not sure. Either way, I was inspired to use the greens to make dinner. 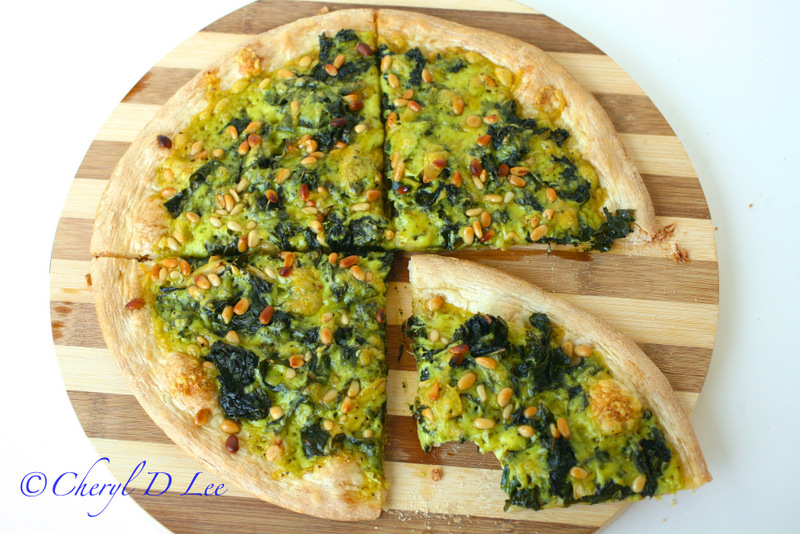 This pizza can be made with any greens you have on hand, even thawed frozen spinach, in a pinch. Trader Joe’s has a Pesto Gouda cheese I like, so I chose that in keeping with the green theme. They also have a frozen pizza crust that are great to always have on hand for those times you need a quick lunch or dinner. 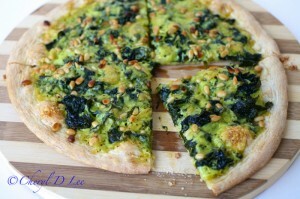 If a Pesto flavored cheese is not available, just use Mozzarella and spread a little pesto on the par-baked crust. before adding the toppings. Heat your oven to °400 F.
Thaw the pizza crust according to package directions. Sprinkle half the cheese onto the crust. Spread the greens on top of the cheese. Top the greens with the remaining cheese. Sprinkle the pine nuts on top. Bake the pizza in the center of your oven for 15 minutes, preferably directly on the rack.